A salt lake or saline lake is a landlocked body of water that has a concentration of salts (typically sodium chloride) and other dissolved minerals significantly higher than most lakes (often defined as at least three grams of salt per litre). In some cases, salt lakes have a higher concentration of salt than sea water, but such lakes would also be termed hypersaline lakes. 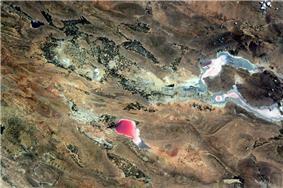 An alkalic salt lake that has a high content of carbonate, is sometimes termed a soda lake. Salt lakes form when the water flowing into the lake, containing salt or minerals, cannot leave because the lake is endorheic (terminal). The water then evaporates, leaving behind any dissolved salts and thus increasing its salinity, making a salt lake an excellent place for salt production. High salinity will also lead to a unique halophilic flora and fauna in the lake in question; sometimes, in fact, the result may be an absence or near absence of life near the salt lake. If the amount of water flowing into a lake is less than the amount evaporated, the lake will eventually disappear and leave a dry lake (also called playa or salt flat). ^ Hammer, U. T. (1986). Saline Lake Ecosystems of the World. Springer. p. 15.